Mark your calendars for our upcoming Family Literacy event on January 26th at Phelps Helps. For a second year, Phelps Helps will be teaming up with Literacy in Action to host an event to celebrate Family Literacy Week, January 20-27th. This event was a great success last year with more than 30 people taking part. 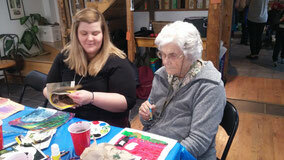 The hands-on ‘Arts and Scraps’ activity will have elements for all ages and is open to everyone. Contrary to popular belief, literacy is not just knowing how to read and write and is not only something we need to develop as children. Literacy includes the skills to effectively read, understand and act on information - increasing one's ability to participate in society. According to Literacy Quebec, literacy is not something you have or do not have, rather it is something that continues to build throughout our lives, but it takes practice. Phelps Helps Family Literacy Program believes that the best way to help young children meet success in their literacy development is by supporting the whole family. This Arts & Scrapes activity with Literacy in Action will provide an opportunity for all family members to participate and foster continuous learning at all ages, while also providing an intergenerational opportunity to participate in a free activity in the community. A reminder that Phelps will be welcoming back our participants from their holidays on January 15th for weekly sessions. We have more than 110 participants between the ages of 8 and 35 so far this school year but we still have room for new participants. Signing up for Phelps Helps programs can be done at any time of the year - contact us to learn more.